The Woodburn Independent newspaper has a new manager of its editorial department. As of Jan. 5, Phil Hawkins is the managing editor of the Independent. He replaces Lindsay Keefer, who served in the role for nearly six years. Hawkins was hired at the Independent to serve as sports reporter in February 2013. Since then, he has maintained management of the sports desk, but has also expanded to news coverage, particularly in coverage of education and Gervais news. Hawkins, a Canby High School graduate, got bitten by the journalism bug while attending college at University of Puget Sound in Washington. "I ended up writing a sports story on a lark for the (school) paper," he said. "I had such a fun time writing for the paper. It was one of those 'aha' moments, where a college student who had never really known what he wanted to do in life goes to college to figure it out." But UPS didn't offer a journalism degree, so Hawkins transferred to University of Oregon, where he enrolled in the school's journalism program. Before he even finished his degree, Hawkins landed an internship with the Tri-County News in Junction City. 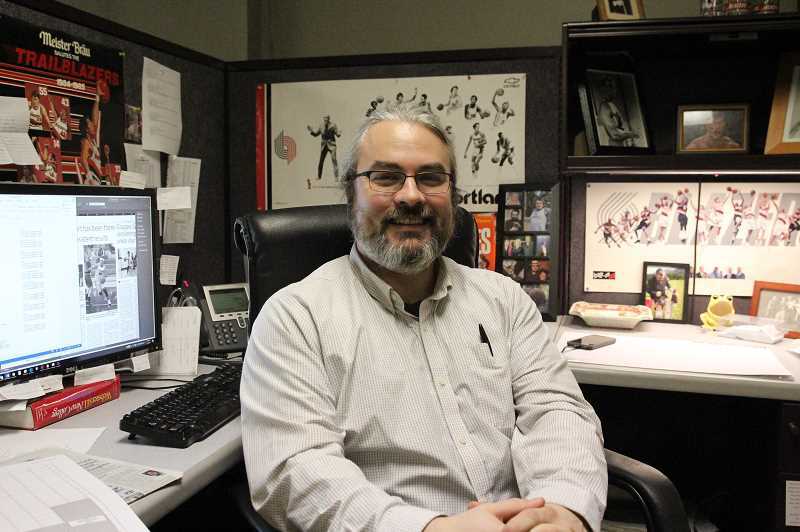 That gig turned into a full-time sports editor position and, a mere four months later, he was promoted to editor in chief. "That was a bit of a shocker," he admitted. With the economic downturn impacting the small newspaper, Hawkins decided to return to school 18 months later to finish his degree. He earned his Bachelor of Arts in journalism in 2009. Hawkins started taking on some freelance sports writing jobs, but mostly dedicated himself to full-time parenthood when his son was born in 2010. He re-entered the full-time journalism field when he was hired by the Independent in February 2013. "I had always had my ear to the ground for the local journalism scene to make sure I was never unplugged," he said. "I thought, I'm not sure I'm ready but this is too good to pass up. At the time it felt like sports positions were hard to come by." Hawkins has enjoyed covering sports news for northern Marion County's five school districts. "Every town I have covered has its own unique identity and feel," he said. "I get a lot of enjoyment finding out more about each town's identity and, by working at the newspaper, helping flesh that out through the stories we cover. That's not something I got into the business to do. I got into it because I like writing sports and had aspirations to cover professional athletics, like the Portland Trail Blazers. Over the years that has changed and I'm more interested in the minutiae of community journalism, meeting and talking with new people, hearing their stories and serving the community." That's why he's ready to take on the editor position at the Independent. "The current position I have, while very comfortable, is not a long-term position," Hawkins said. "I have ambitions beyond doing sports only." However, with a small news staff, Hawkins will be able to keep the sports passion alive by maintaining his sports beat. Publisher Al Herriges said, "Phil will continue the tradition of Woodburn Independent editors' standard of community journalism, that not only includes credibility but also compassion for the community we serve." Hawkins said he has big shoes to fill but is confident he will maintain that standard. "Even though I've done this before, it's still something that fills me with a bit of anxiety filling those shoes but I feel I'm ready to do so," he said. "Having a stable editor there has its benefits, and the fact that Lindsay and I worked so closely together makes this transition a lot more seemless and more smooth and more comfortable than it could have been — certainly much more so than the first time. Having that stability and having someone there I could learn from is going to be very beneficial with this transition." When he's not working, Hawkins enjoys tabletop gaming, crafting, skiing, art and baking, often with his wife and 8-year-old son.